Ready or not, summer is here! With a few seasonal holidays coming up, now is the perfect time for a summery campaign. Stumped? Take a cue from this week’s campaigns, which feature a BBQ-themed Pick Your Prize giveaway, a Father’s Day refer-a-friend sweepstakes and a “memorable moments” photo contest. Best of all? Every one of the campaigns can be created quickly using our templates, giving you more time to work on your tan lines. Who doesn’t love a good backyard BBQ? The folks at Abeles & Heymann (A&H), makers of kosher hot dogs and other deli provisions are giving away three amazing gifts to transform your backyard into the BEST grilling spot in town. 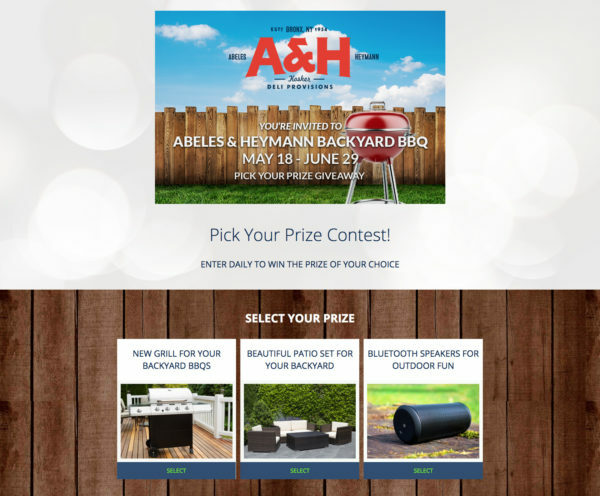 Using our Pick Your Prize template, A&H is letting fans choose what they want to win: a new grill; a beautiful outdoor patio set, or Bluetooth speakers for outdoor entertaining. To increase their chances of winning, people are encouraged to enter once a day. Father’s Day is still a few weeks away, but why not start your campaign now? Jack Stack’s “Dad Food” sweepstakes will definitely get your creative juices flowing and your mouth watering! 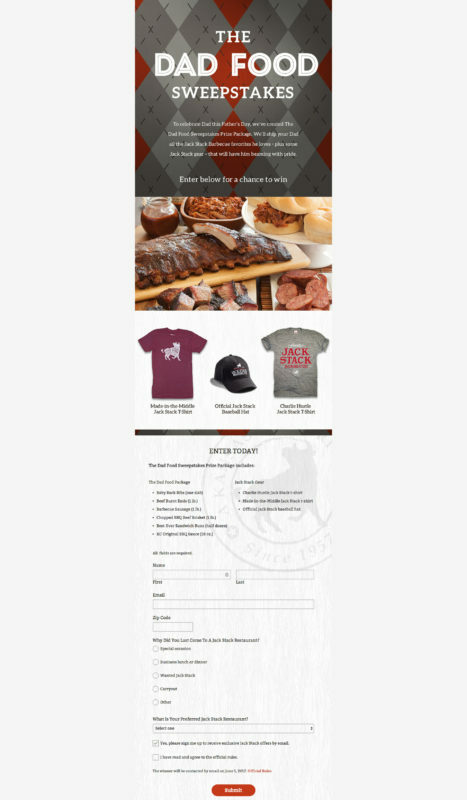 Jack Stack has created a prize pack any (meat-eating) dad would LOVE, while at the same time collecting valuable information about their customers. Plus, they boost the incentive for entrants to spread the word about the campaign using our refer-a-friend template features. IDEA: Give people the opportunity to earn extra entries or points for providing extra information by using our points per field feature. Toro knows that backyards are more than just grass: Yards are where memories are made with family and friends. 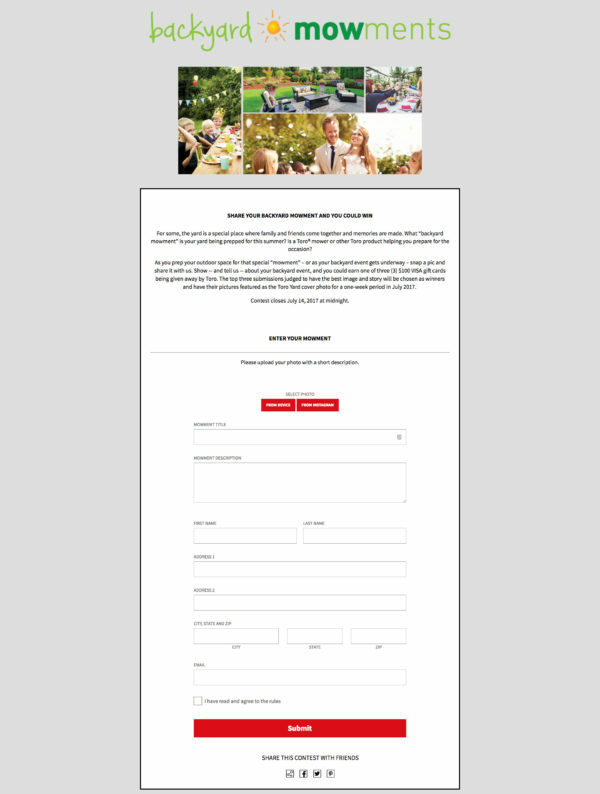 This summer, Toro is encouraging folks to share memorable events with their Backyard Mowments photo contest. Photos will be displayed on the campaign and winners will be chosen by a panel of judges instead of by voting. Winners receive a $100 gift card, and the top three submissions will have their pictures featured as the Toro Yard magazine cover photo for one week in July. TIP: Do you want to show a gallery of entries, but choose the winner yourself? You can! Check out our community post to learn how.